Like many of LSBU's research centres, the Sports and Exercise Science Research Centre (SESRC) has an outstanding reputation within industry. SESRC, in particular, assisted in the design and creation of a midsole technology, which became the springboard for the launch of the now globally recognised brand, FitFlop™. Marcia Kilgore, the Founder of FitFlop Ltd, approached SESRC in 2006 after hearing about the centre's expertise in foot and ankle biomechanics. The remittance was simple: design a footwear technology that 'perturbs the wearer slightly' and asks more of the stabilising muscles of the lower extremity. After several iterations of prototyping a concept, a column-based multi-density midsole design was finally approved and tested. A patent was then filed under 'Microwobbleboard™' technology, naming Dr Dave Cook (LSBU) and Ms. Kilgore as co-inventors. Their initial sandal, Walkstar™1, was an unprecedented success. 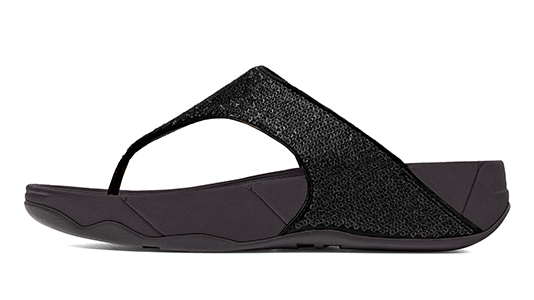 As a result, FitFlop™ expanded the range of its footwear from the one style of sandal to a range of shoes incorporating the 'Microwobbleboard™' technology for men as well as women. Since 2008, FitFlop Ltd. has committed in excess of £200k to SESRC for progressive research and development. This work has been invaluable to the Company as they seek to extend their product range and capitalise on the underpinning science for seasonal marketing initiatives. Their relationship with LSBU continues to the present day, with a joint-funded PhD research programme in place. The success of the FitFlop™ brand has been remarkable. Over 22million pairs of FitFlop™ shoes have been sold. In 2008, FitFlop Ltd. employed just 17 workers; today that figure is in excess of 160. Thanks to ecommerce, FitFlop Ltd. now ships to 58 countries, with websites in the UK, France, Italy, Spain and the USA, and each pair of shoes sold, incorporating Microwobbleboard™' technology, contains a label acknowledging LSBU's involvement in the development of the footwear. Aside from commercial success, the clinical application of the technology has also been recognised. A leading consultant orthopaedic surgeon at Royal Surrey Hospital has praised the value of FitFlop™ sandals: "Patients with painful feet usually select a flimsy soft shoe, not realising that they need the opposite. The combination of support and cushioning that the FitFlops™ provide is perfect for nearly all my patients. No other commercially available shoe is better. Prescription shoes are almost a thing of the past." As well as this endorsement, FitFlop Ltd. has also received the American Podiatric Medical Association Seal of Acceptance, alongside numerous business awards, including the 2011 Draper Footwear 'footwear brand of the year' Award.